A delightful silver heart pendant for any ocassion. Featuring a sparkling diamond in one corner. 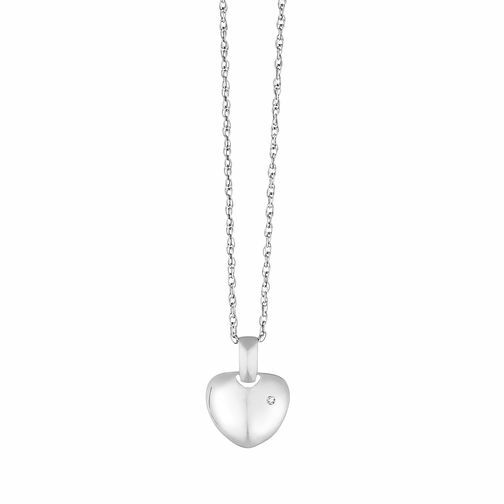 Silver Diamond Heart Pendant is rated 4.3 out of 5 by 3. Rated 3 out of 5 by Anonymous from Very pretty piece of jewelley Bought as a gift. Overall a very pretty necklace. A little disappointed at the size of the diamond, I could not see it without a very thorough inspection! The length of the chain is perfect, not too long. The recipient was happy with the gift. Not sure it was worth £70, the original price, but as it was on sale at an offer price, happy with the product. Rated 5 out of 5 by Anonymous from Stunning Piece A beautiful item and so delicate! It was exactly what I needed in a gift. Would recommend this stunning item to anyone.